This book was sent to me by the publisher to read and review. After reading it, I find myself in the awkward position of critiquing a book written by an actual writer – as in, she’s got degrees and she teaches writing at the University of Oregon. So what do I know? All I can do is review it from a layperson’s perspective, and not as anyone who claims any knowledge or expertise about what constitutes good writing. Why it matters to me might be this: I can’t describe, or evoke, what happens to me in fall, but it’s the time when I have the most potent sensual awareness of the present. that’s very abstract. Yet today in the garden, pouring the bucketful of old stems, finished blossoms, and yellow leaves into the big bin, I got a visceral spang of being alive. Something about the dense mix of colors, of heightened dark or bright. The wet leaves shine, as do the brown-tipped petals of the yellow and the salmon-colored dahlias, the burnt brown seed heads of the Moonbeam coreopis. I awaken, and my memory is hungry, as if it has an appetite of its own, dormant much of the time . . . . The problem I had was the story itself – in some ways very esoteric and aimed – intentionally or not – at a very specific audience, which I would say would tend to be academic, middle-aged women who love gardening. This is a memoir covering a two-year period in Ms. Sandor’s life, during which she leaves her first husband after falling in love with a colleague, and she and her new love begin the process of building a new life together. On a personal level, I had to keep reminding myself not to judge – after all, I was in a very similar boat in my own life about thirteen years ago! Because she doesn’t really describe the demise of her first marriage in any detail (no doubt for the sake of protecting the privacy of all involved – understandable), and her new love remains a mysterious and completely undeveloped character throughout the story, I did find it difficult to empathize, however. So they buy an old house in an old neighborhood and begin the process of starting over in middle age, with the author’s young daughter ferrying between her old home with her father and her new home with her mom and mom’s new boyfriend. Almost immediately, the new couple is faced with a serious health crisis – but even that isn’t really gotten into in much depth, so it doesn’t feel as traumatic to the reader as I’m sure it was to the real people in real life. 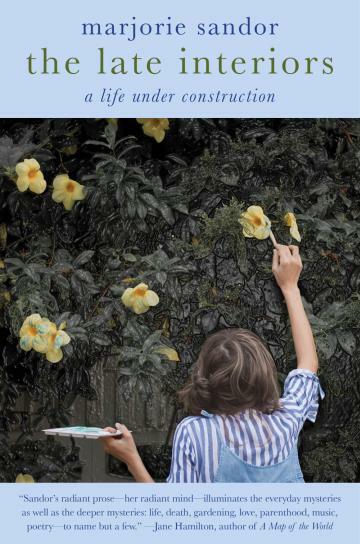 The story really centers around: (a) the author’s love of gardening, which is gone into in great detail throughout the book, and (b) their battle with the City over the proposed demolition of historical homes in the area and the construction of a monstrous apartment complex. Sometimes poetic, sometimes self-indulgent and almost pretentious (she’s very fond of words like insouciant and elegiac, I wish I could have liked this book more than I did.